Reverend Horton Heat is the stage name of American musician Jim Heath as well as the name of his Dallas, Texas-based psychobilly trio. 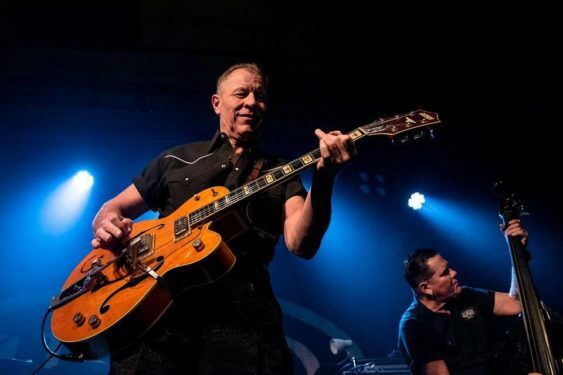 Formed in 1985, Reverend Horton Heat exploded on the scene by playing gigs around their hometown of Dallas, Texas, mixing elements of surf, country, punk, big band, and rockabilly to create a genre that took the world by storm. With the band’s million plus album selling career, their music has been featured in countless TV shows, movie, and commercials they are often imitated but can never be duplicated. Sorry! The contest for Godfather of Modern Psychobilly: Reverend Horton Heat | Slim's has ended.